Connor Hamm prayed before the incorrupt heart of St. John Vianney on March 14 at St. John Vianney High School where Hamm is a freshman. The school was among the stops of the nationwide “Heart of a Priest” relic tour, sponsored by the Knights of Columbus. Lucas Wilson set his alarm for 5 a.m. — an extra half hour early — in anticipation of a special moment. The 14-year-old was going to see the heart of St. John Vianney. heart of a saint. Rather he wanted to pray through the man known as the Curé of Ars, who became known for his ministry a parish priest to the people of Ars, France, leading to a spiritual transformation of the community. Lucas is discerning a vocation to the priesthood. 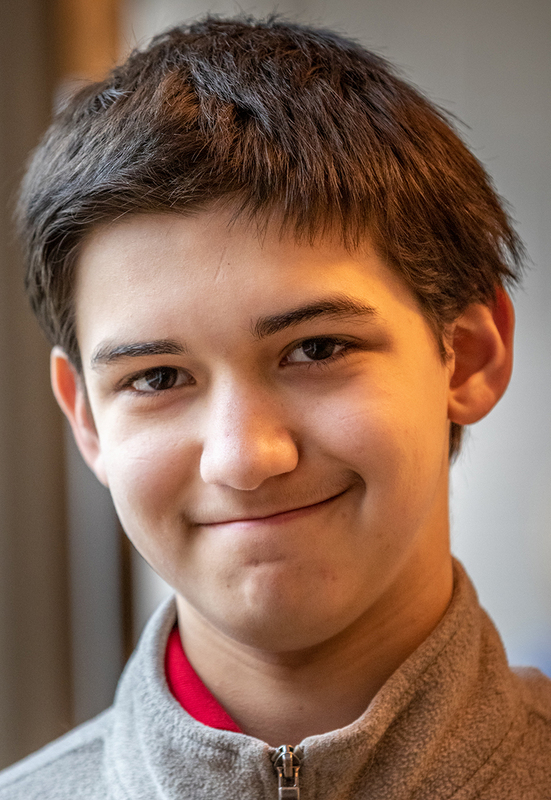 Lucas and his family were among hundreds of people who viewed the relic at St. John Vianney High School in Kirkwood March 15. It was also hosted at the Cathedral Basilica of Saint Louis as part of a nationwide “Heart of a Priest” relic tour that began November and is sponsored by the Knights of Columbus. 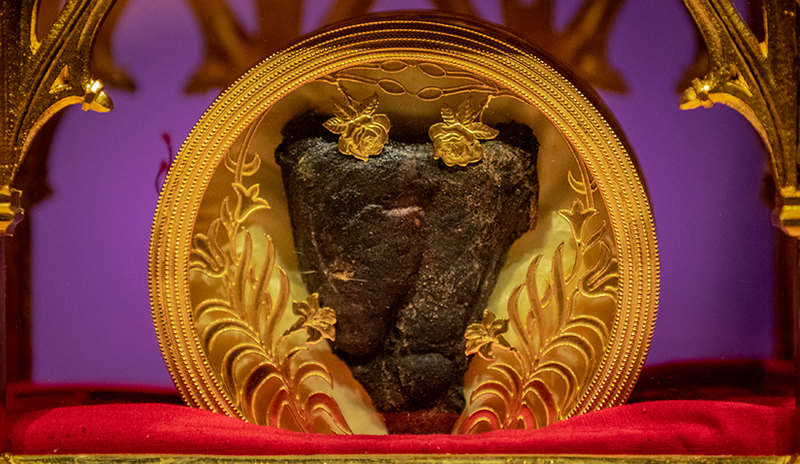 St. John Vianney’s incorrupt heart is considered a major, first-class relic. Ordained in 1815, he was assigned to a small village of Ars in the Diocese of Lyon, France. The town had mostly abandoned the faith, and the parish had been neglected. His prayer life and devotion to the sacraments made an impression upon the people. He spent hours hearing confessions and was earned a reputation for being able to read souls. He died in 1859 at the age of 73. Later, when his body was exhumed as part of his cause for canonization, it was discovered that it was incorrupt. His body is now enshrined at the Basilica of Ars, and his heart was placed in a reliquary at the Shrine of the Curé’s Heart in Ars. Pope Pius XI canonized him on May 31, 1925, and became known as the patron of parish priests. His feast day is celebrated Aug. 4. St. John Vianney’s incorrupt heart is considered a major, first-class relic. 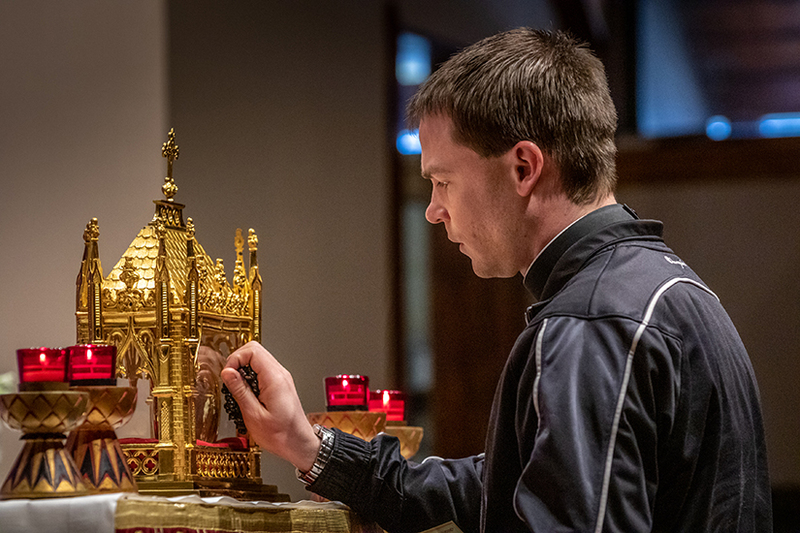 Father Thomas Vordtriede touched a rosary to the reliquary containing the incorrupt heart of St. John Vianney on March 14 at St. John Vianney High School. Vianney senior Grant Atwood said it was “a pretty cool thing” to have the heart of their school’s namesake come all the way from France. He also admires that St. John Vianney grew up during the French Revolution — a time when he could have easily been put to death for practicing the faith. The saint “personifies what it means to be a Vianney student; to go out in the world and profess the faith, and also be willing to take risks so you can spread the Good News of God,” Atwood said. Vianney president Mike Loyet described the Cure of Ars as a great role model for students. “We can learn so many lessons from him,” he said. “It ties in so well with our Marian charism — the humility, the willingness to take a risk, the whole idea of forgiveness. We think he’s an awesome saint. of the French Revolution. He is famous for hearing confessions for up to 18 hours a day as people from across Europe came to see him. His notoriety throughout the Catholic world continued to grow after his death in 1859, and today he inspires a quest for holiness by both priests and the laity. In Catholic tradition, a relic is a physical object associated with a saint that may be offered to the faithful for veneration. Relics and saint aren't to be worshipped. They are venerated as holy objects in recognition of the fact that God has worked through the saint. A major or first-class relic is defined as a part of the saint’s body, as opposed to something that the saint touched or wore. The term incorrupt refers to a human body that has avoided the normal process of decomposition after death. It is a sign — but not proof — of the person’s holiness, and is sometimes seen in Catholic saints and those in the process of canonization.